Kathleen Lindsley prevents my occasional excursions to photograph inn signs from becoming the weird pastime of someone who is a close cousin of train spotters or stamp collectors. 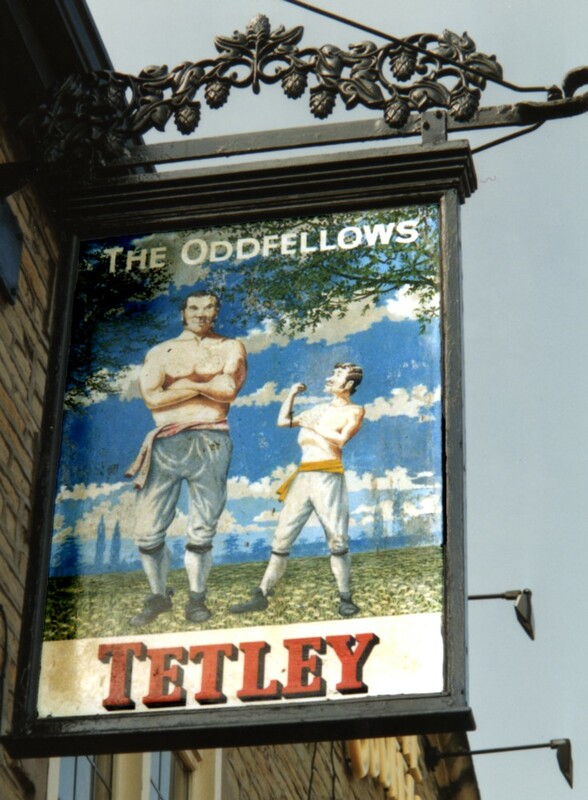 Whenever I rehearsed my excuses, ready to trot them out if ever caught in the act, I always protested that inn signs carry clues about history, sometimes tell you about the locality and are, at times, amusing as with The Oddfellows at Wyke which instead of showing the usual Friendly Society arms portrays the ultimate in catch-weight boxing. But most of all, I would claim, inn signs represent an open-air art gallery, free to all, where they can find landscapes, portraits, animal paintings, sporting prints, heraldry, transport, trades and travel. That of course is true. What slightly diminished it as an excuse for being nerdy and left me still feeling open to gentle ridicule, is that most inn signs look good from a distance but if you get up close they are not great works of art. But then I discovered the series of signs created by Kathleen Lindsley for Samuel Webster’s West Riding pubs in the 1980s and I could produce my camera without fear of scorn. These wood engravings would look at home in any gallery. They were commissioned by Pentagram, the upmarket design agency with blue-chip clients like the V&A, the Art Institute of Chicago, Saks Fifth Avenue, Cosmopolitan, Tiffany and Alexander McQueen. Whichever partner came up with the idea of using Kathleen Lindsley had a stroke of genius. Born in Gibraltar, she studied art at Newcastle upon Tyne and started to specialise in wood engraving in the 1970s. In 1987 she moved to live in Skye where much of her work is capturing that isolated, rugged but beautiful spot in all its moods. The 1980s commission was to re-brand the brewery. Of course, back in those less trendy marketing days, it wasn’t described as re-branding, rather it was ‘to fashion a new identity for Samuel Webster: an identity that would reflect both the long family tradition of the brewery and the individual character of its pubs.’ But Kathleen Lindsley did more. She produced a series of engravings that have all the qualities of Yorkshire – power, beauty, subtlety, humour, tradition and sense of place. The bold black and white signs, with occasional splashes of colour, work well from a distance but they have enough interesting detail to make close-up study worthwhile. Indeed, Pentagram were so impressed they produced an exquisite little book in a limited edition of 350 copies, printed on Zerkall mould-made paper signed and number by the artist. I paid £80 for No81, the most I have ever paid for a book, but it turns out to have been a bargain because according to the internet, there currently appear to be only five copies available around the world, and all of them more expensive than that. 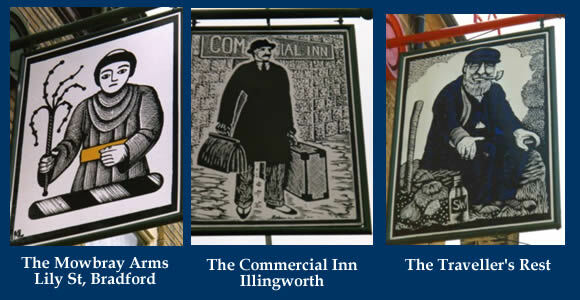 I love many of the designs – the monk in the Mowbray Arms, Victoria at two different stages of her life, the old boy at the Traveller’s Rest, the dramatic Noah’s Ark and the Commercial Inn which reminds me of some of my older colleagues when I was a rookie sales rep at Penguin Books. But if I were only allowed one, it would have to be The Stocks Arms at Northowram which features at the top of this piece. When I first saw it, I thought it must be based on a local legend but I could find no mention of it. 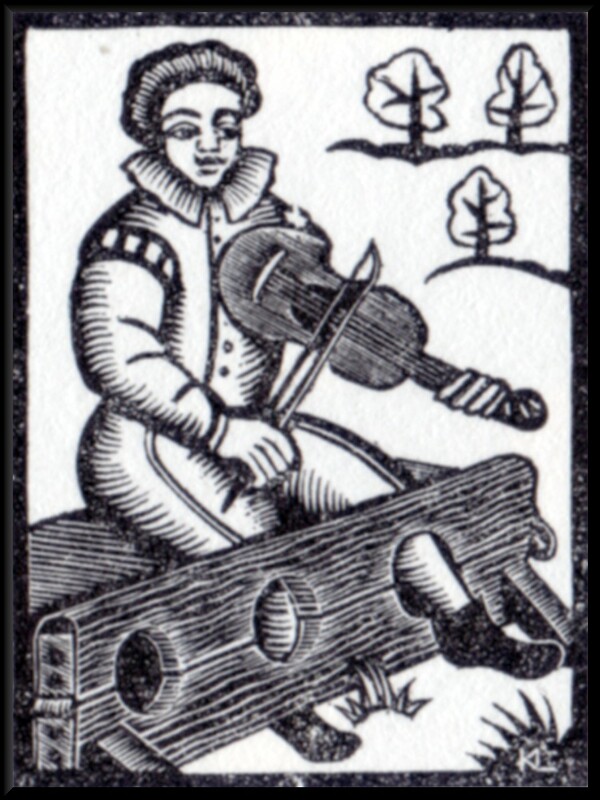 Why is the prisoner playing the fiddle? Why only one leg in the stocks? And why that hint of a smile? Looks like I may have to invent my own legend. Or do you know better? You can see more of the Samuel Webster inn signs on Kathleen Lindsley’s website along with many of her other work. One of the sad things about writing this piece was discovering when I looked up some of the pubs on google, that many of them have gone the way of so many country pubs and closed. It seems the local, ‘where everybody knows your name’ is fast becoming a part of history. If you’re a nerd, so am I. I moved to Yorkshire 20-odd years ago, and it took me a while to cotton on to these brilliant signs. When I finally did, about 9 years ago, I decided to photograph as many as I could – which is now the grand total of 7! Not very prolific. Through CAMRA newsletters I’ve put out a call to find more, but they are disappearing so fast… A reader told me who KL actually was (I had no idea) and she was kind enough to reply to my emails. I’m buying a print of hers, just so I can have a wee pub sign of my own!